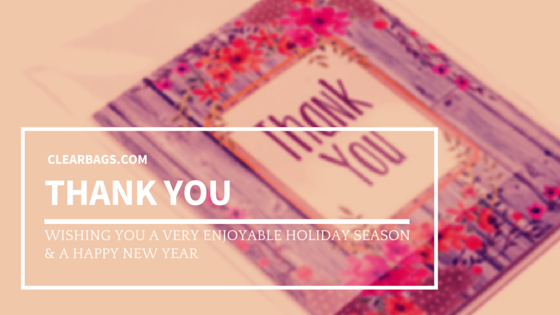 We would be remiss if we did not take time at the conclusion of our year to express appreciation to the many loyal customers who have made what we do possible. As we conclude our 23rd year, we are happy to report we were able to service more customers than ever before. Additionally, we are proud to say we had more 1st time customers use our products this year than any previous year. We continue to serve several hundred customers each and every work day. Our goal has been to offer exemplary service with the highest quality packaging available in our industry today. 2015 has been a wonderful year for us. We hope it has been prosperous for you also. We at ClearBags wish you a very enjoyable holiday season and a happy new year. Save 10% until December 31st. Choose from our wide selection of Pre-tied Bows, Organza Ribbon and Twist Ties to finish off your presentation. Expires December 31st *Please note, discounts only apply to stock items; they do not apply to custom orders. Discounts cannot be combined. Protect your shoe collection all year long with our Wholesale Shoe Boxes. Our frosted boxes come in two sizes and can fit a variety of items. You can use these as organizing containers, storage boxes, or even gift-type packaging. Expires December 31st *Please note, discounts only apply to stock items; they do not apply to custom orders. Discounts cannot be combined.